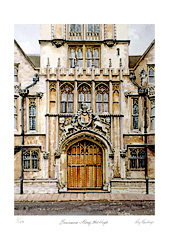 Brasenose College was originally known as ‘The King’s Hall and College of Brasenose’. It was founded in 1509 by the Bishop of Lincoln and Sir Richard Sutton and takes its name from a brass knocker in the shape of a nose which used to hang on the gate of the original Brasenose Hall. This knocker now hangs over the High Table. 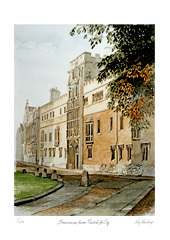 The four storey Gate Tower of 1512 leads from Radcliffe Square into Old Quadrangle. Above the panelled façade is an oriel window which is flanked by two statues in niches. The east end of the Chapel, built in 1795, faces Radcliffe Square. Broad pilasters flank the Gothic arched windows below a parapet decorated with urns and decorated pinnacles. Next to the Chapel is the Library, the façade of which was remodelled by James Wyatt in 1782.